Victoria Sponge just might be the next big baking trend! Not. You know I can't be bothered with all that nonsense: cupcakes versus whoopie pies versus cake pops versus macarons. Let the bandwagons roll by! In or out, trendy or passé, the only thing I care about is how well something goes with a cup of tea. Victoria Sponge, named after the Queen, is an English classic that goes perfectly with a good cup of tea. My strong preference for jam and cream rather than thick sugary frostings is, I always supposed, an English thing I inherited from my mother and her mother. We never sweetened the whipped cream for this cake, but you can if you like. And do use the highest quality raspberry or strawberry jam or preserves you can find, since it is such a huge part of the cake. The only homemade jam I have left is peach (and that just won't do for this), so I had to use store-bought. I love Cascadian Farm Organic Raspberry Fruit Spread. This recipe takes about a third of a 10-ounce jar. For my readers in the UK, I have a British Conversions page (see the link on the horizontal menu bar). But just for fun, I included them in this recipe. If you're not from the UK, call up your inner Anglophile and make this lovely cake. Just looking at it makes me want to give a garden fete! 1 Preheat oven to 350F/180C /Gas4. Butter well and lightly flour one 7-inch layer pan (18-cm sandwich tin). In small bowl, sift together flour, baking powder and salt. 2 In medium bowl, with electric mixer (electric hand whisk), cream butter. Butter must be very, very soft to start with. If you didn't get the butter out 3 hours ago, don't try to make this cake. Add sugar and vanilla, and continue creaming until light and fluffy. While beating, slowly drizzle in beaten eggs. Continue beating until light and fluffy. With large metal spoon, fold in the flour mixture after sifting it over the batter. Stir in the milk. You may not need the entire 1/4 cup; batter should be rather stiff, of a consistency to drop from the spoon. 3 Pour into prepared pan/tin. Bake for about 25 to 30 minutes, or until toothpick inserted in center comes out clean. Do not underbake. 4 Cool in pan on wire rack for 5 minutes. Remove from pan and cool on rack for an hour. 5 Not long before serving, whip cream and vanilla (and not more than 2 teaspoons of sugar, if you really must!) until stiff. As you can see in the photo, I go a little crazy with the cream; you could probably just use 1/2 cup. Split cake and spread bottom half with jam and top half with whipped cream. Put top half in place and sprinkle with powdered sugar (icing sugar). Cut into 6 or 8 wedges. * A 7-inch cake pan might be unusual to Americans; but since that was the "English" thing, I of course had to have the 7-inch tins. I've had mine forever. Now, as then, they can be a bit hard to find. Order here: Parrish Magic Line 7 x 2 Inch Round Aluminum Cake Pan. Note: A couple of readers just told me their ovens are out of order just now, so I've added this recommendation: Cuisinart TOB-195 Exact Heat Toaster Oven Broiler, Stainless. Jean, I am so glad you posted this! I haven't had Victoria Sponge since I was a kid...and only then I had it maybe 3 times. I remember it tasting so wonderfully light.. and the cream/jam combo was out of this world!! Yours looks divine! Thanks, Jenn! I hope you'll make it soon and let me know how it turned out for you. Jean, your ideas and recipes are positively dangerous to an impressionable young man like me. Thanks, Tony! 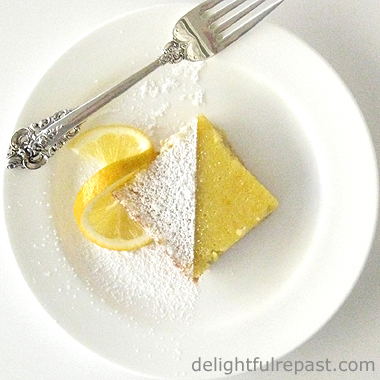 Now get into the kitchen and make this, though it won't be done in time for afternoon tea! Yes, yes! Victoria sponge has to be my favorite ever. Back in the 1980s the late Laurie Colwin published a recipe for this sort of spongecake in *Gourmet* magazine, writing that for English women of a certain age, it was something they could make in their sleep. I am now a woman of that certain age, but not English, and can almost but not quite make it in my sleep. Very best, and thank you for reintroducing us to a worthy classic. Oh, Sully, how do I put up with you! This aversion to tea must be overcome. I implore you to follow my explicit directions and make a proper cup (pot) of tea three times a day until you see the light. Jean, thank you for putting up with my inane comments. You are great. One of my daughters, Emily, loves cooking and has a done a number of cookery courses over the years. She will help me make the Victoria Sponge. She is off to university next year and studying hard for her final exams. By the way I got the idea for all the umm's and aagh's from a poem by Michael Rosen called Chocolate CAke. Michael Rosen is a brilliant children's writer. Teachers tend to use a lot of his poetry to inspire children's writing in schools over here. Here is Michael Rosen's CHOCOLATE CAKE. just discovered the poem exceeds the number of permitted characters. Her's a link to the poem instead. Thanks, Natalie! Your espresso/chocolate variation sounds delicious too. I'm so glad you mentioned Laurie Colwin. I love(d) her and so enjoy rereading her books from time to time. Thanks for the reminder! If I drink tea three times a day, the only thing I'll see is the aperture of the porcelain appointment in my room for purposeful plumbing – and methinks there is no light at the end of that tunnel. I don't drink tea, smoke tea, or place one beneath a golf ball. Lacking social graces and context, do I really need to change? Rooting through life sans formality seems to suit me to a T.
I love a good victoria sponge like what you made for afternoon tea. It looks so good and delicious. Yum. Thank you, Michael! I hope you'll make one some afternoon soon. Hey Jean, that looks absolutely scrumcious and delightful. Next time we come to the USA we'll have to come visit you for a delightful repast of sponge and tea. And unlike our good friend Sully, I looooove a good cup of tea! Thank you! That would be delightful, Grant! Would you come over to my house and make this sponge cake for me? Yum! I would love to! I could be a Janeite on the James! I wonder if I could use this cake with strawberries and whip cream like strawberry short cake. Yes, I've used it like that. If there is lots of liquid with the strawberries (as I like for shortcake), I prefer to split the cake horizontally and cut it into wedges then assemble each serving individually. Makes for less messy servings. 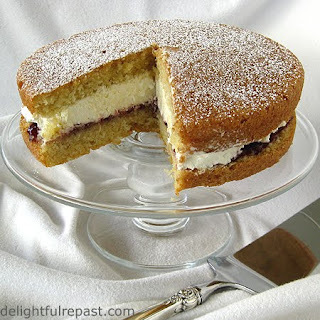 Victoria sponge wow a classic that I'd need often this is really heavenly! Thanks, Gera! I need to do some exploring and see what some of the classics are in Uruguay! Natalie, thank you! Yes, I expect to be making it a number of times this summer. Perfect for tea in the garden. I made this exactly as instructed. The cake didnt rise at all and 25min was way to long for such a small amount of batter! I would recommend doubling and put it in one 7" pan. Hi Anonymous, I'm sorry you had a disappointing result. Did you put the batter in two pans? There is just enough batter for one 7-inch pan. Everyone's oven is different; 25 minutes works in my recently calibrated oven. Also, anyone using a glass pan rather than metal should lower the temperature for any baking by 25 degrees. The only reason I can think of for the cake not rising properly is baking powder that is not fresh. When did you replace your baking powder? I hope some of these thoughts will make the recipe work for you. Happy baking! The cake sounds lovely and I like that you put a generous filling in it. But the habit of flavouring and sweetening the cream makes me shudder. Good cream needs neither flavouring nor sweetening. Laraine, thank you. And I quite agree with you about the cream. But readers in the US will look at my suggestion to use "not more than 2 teaspoons of sugar, if you must" in 6 fluid ounces of cream as crazy talk -- most add a *lot* more. Do read my Chocolate Cream Pie post. It has the story of my recent problem with cream. Let me know if you've ever had that problem.